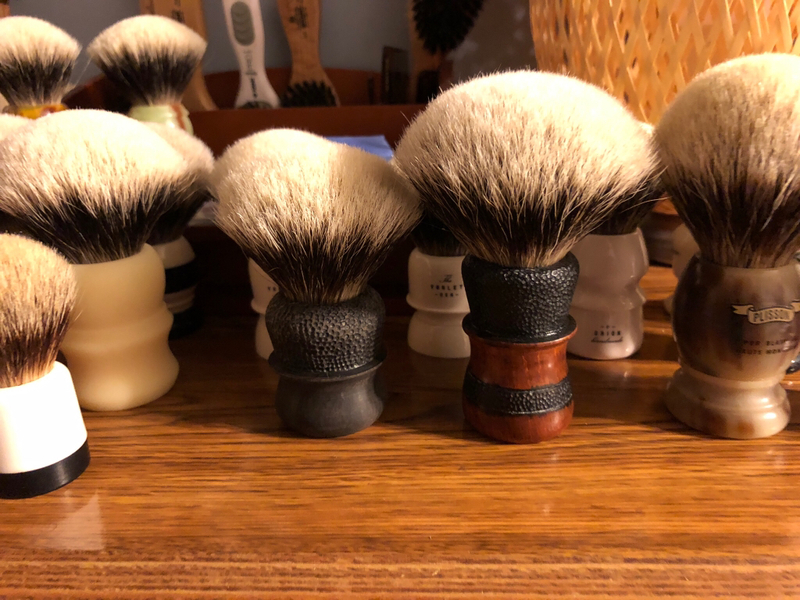 My brush collection has outgrown my storage, yet again. Both brushes are in immaculate condition and each used less than 10 times. They are also currently not available to purchase directly so don't hesitate! Prices include US shipping and insurance as well as PayPal fees. (10-13-2017, 06:59 AM)blzrfn Wrote: My brush collection has outgrown my storage, yet again. Both brushes are in immaculate condition and each used less than 10 times. They are also currently not available to purchase directly so don't hesitate! Prices include US shipping and insurance as well as PayPal fees. 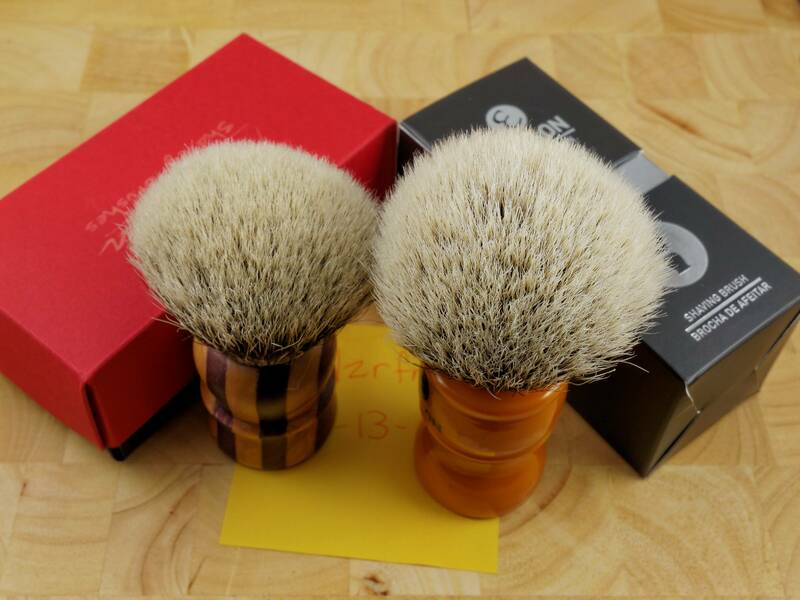 On the left is an Artesania Romera Multi-Wood Chubby style brush. The knot measures 27mm in diameter with a 52mm loft. The tips are very soft and the backbone is moderately firm. This is an exceptional example of what Gustavo is capable of producing. I paid $140 for this brush and waited a very long time for delivery. It can be in your hands in a matter of days for $120. 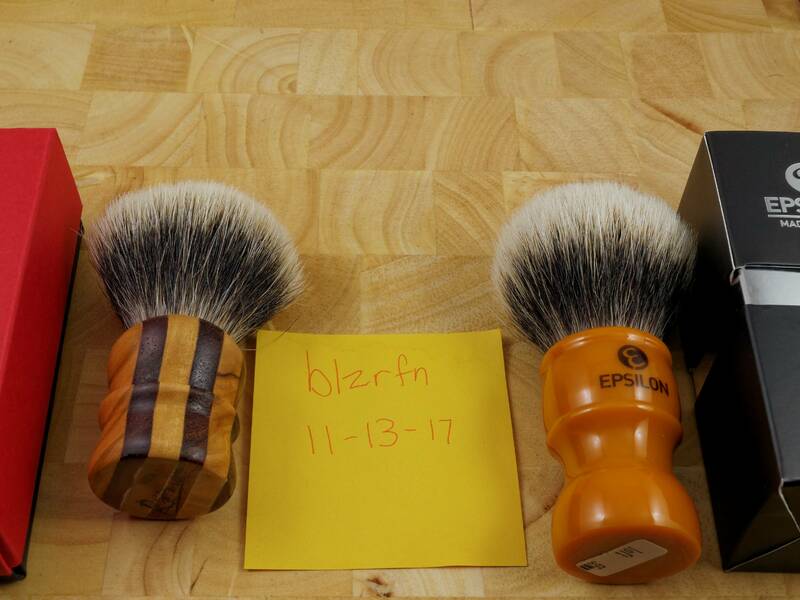 On the right is the newly released Epsilon Butterscotch Barber 2-Band. The knot measures 27mm x 56mm. There is an extensive review on this brush in the brushes forum. Excellent brush at an excellent price. This brush is currently sold out. I paid $55, yours for $50. What is the loft on the Romera? (10-22-2017, 02:27 PM)Sevenbark Wrote: What is the loft on the Romera? Surprising no one has jumped on that Romera brush yet. I'm tempted by it, but thankfully my Rustic Chubby and Rustic Chubby Barber brushes are keeping me held back. Beautiful brush! (10-24-2017, 09:34 PM)kooshman7 Wrote: Surprising no one has jumped on that Romera brush yet. I'm tempted by it, but thankfully my Rustic Chubby and Rustic Chubby Barber brushes are keeping me held back. Beautiful brush! Thanks Joe! If I didn't own another similar brush from Gustavo it definitely wouldn't be for sale. I'm trying to get the collection down to about 80 by the end of the year and it's very hard to choose. My two Romera brushes. Three actually, but the third is a 3-band, thus with its 3-band brothers and sisters. (10-25-2017, 06:21 PM)kooshman Wrote: My two Romera brushes. Three actually, but the third is a 3-band, thus with its 3-band brothers and sisters. You're not helping, I'm trying to reduce my collection! Last price drop before returning to the cabinet. Is the Romero still available? If so, can you do $75 for it? It is still available. $95 is the lowest I am willing to go as it is a very nice brush and one I don't mind keeping in the collection. I had just received my knot from Romera. I just got it set and on my third lather + and that is some soft hair with some back bone. (11-09-2017, 03:30 PM)Sevenbark Wrote: I had just received my knot from Romera. I just got it set and on my third lather + and that is some soft hair with some back bone. Did he use Correos for shipping to you?